According to an eye-witness, Samira Lamrani, A baby was caught by a member of the public after being dropped from Grenfell Tower as it was engulfed with flames. The more I looked up, floor upon floor. Endless numbers of people. Mainly the kids, because obviously their voices, with their high pitched voices – that will remain with me for a long time. According to LBC, Another resident said she saw a woman throw her son, who was about five years old, from a fifth or sixth floor window to escape the blaze. “One woman actually threw her son out of the window. I think he’s OK.I think he might have just had some broken bones and bruises. I left my phone at home so I went back to grab it and, by the time I got back, the road was completely blocked off, the fire had dramatically spread. It was like a scene from a Hollywood movie. There was another woman screaming ‘my baby, my baby, I need to get out, I need to save my baby’. At least 12 people have been confirmed dead in the huge fire that ripped through the west London tower block, but police expect the death toll to rise. 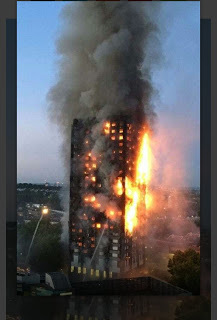 Although, Up to 600 people are believed to have been inside the Tower’s 120 flats when the blaze tore through the 24-storey building in the early hours.